3 release levers each lift the clutch pressure plates in the centre of the clutch housing against the force of the clutch pressure springs. Lifting the clutch pressure plates disconnects the force low between the gearbox and the engine. 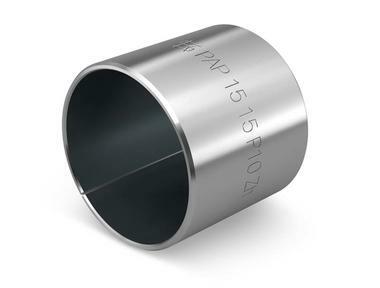 The thin-walled plain bearings with small dimensions are optimal for the compact design of the clutch. The high stress levels from the force of the clutch pressure springs are no problem for the plain bearings. KS PERMAGLIDE® plain bearings are resistant to clutch disc abrasion and can withstand the maximum application temperatures of 180 °C, despite the high levels of stress. Composite, multi-layered material: lead bronze sintered onto a steel base, friction-minimising additives PTFE and lead. In damp environments in particular, this sliding layer system provides outstanding protection against corrosion. Moreover, lead and PTFE have an extremely low absorption tendency. Absorption of the surrounding luids, swelling of the materials and chemical damage to interacting sliding partners are eiciently prevented. The result is dimensional stability and optimal guide accuracy during use. The material P10 contains lead and, in accordance with the end of Life Vehicle Directive, may not be used in the automotive field. The material P14/P147 (unleaded) can be used for these applications.